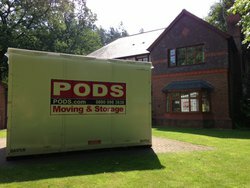 PODS Portable storage units are available to be delivered all over Manchester and Cheshire. Keep your PODS Container on your property to store your belongings while you move house, renovate or just need some extra space. Prices from just £18.00 per week for our 12 foot PODS Container with 50% off your 1st 8 weeks storage and from just £30 delivery in Manchester. We offer unique self-storage. We deliver the storage to you so you take your time to load/unload.